Proprietary Name: Lilikoi Light Defense Face Primer Spf 23 What is the Proprietary Name? Non-Proprietary Name: Zinc Oxide, Titanium Dioxide What is the Non-Proprietary Name? 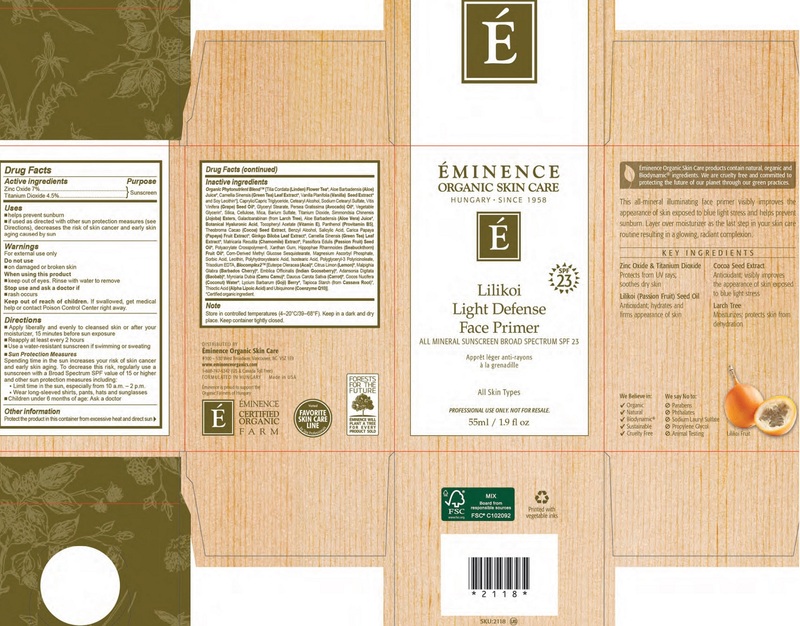 Lilikoi Light Defense Face Primer Spf 23 with NDC 15751-2323 is a a human over the counter drug product labeled by Eminence Organic Skin Care Ltd.. 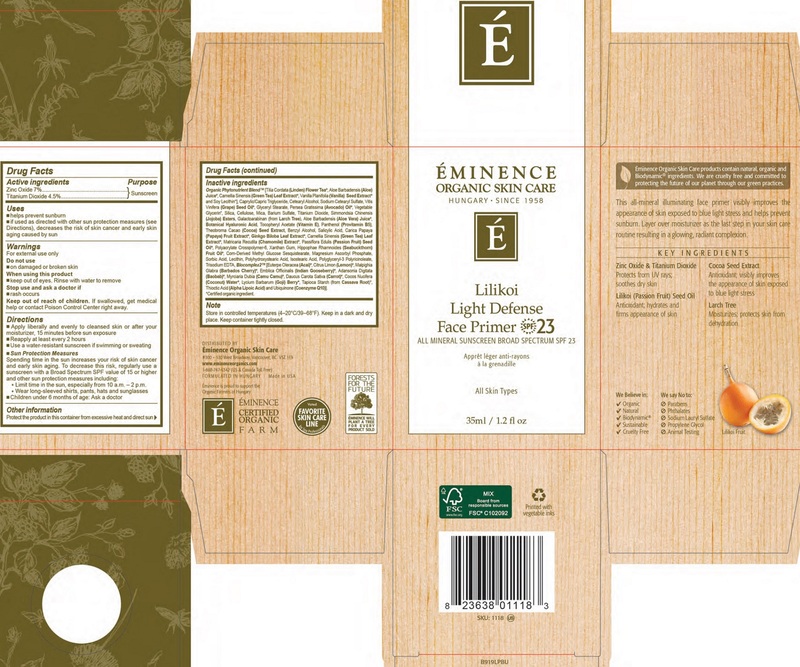 The generic name of Lilikoi Light Defense Face Primer Spf 23 is zinc oxide, titanium dioxide. The product's dosage form is lotion and is administered via topical form. Organic Phytonutrient Blend [(Tilia Cordata (Linden) Flower Tea, Aloe Barbadensis (Aloe) Juice, Camellia Sinensis (Green Tea) Leaf Extract, Vanilla Planifolia (Vanilla) Seed Extract and Soy Lecithin, Caprylic/Capric Triglyceride, Cetearyl Alcohol, Sodium Cetearyl Sulfate, Vitis Vinifera (Grape) Seed Oil, Glyceryl Stearate, Persea Gratissima (Avocado) Oil, Vegetable Glycerin, Silica, Cellulose, Mica, Barium Sulfate, Titanium Dioxide, Simmondsia Chinensis (Jojoba) Esters, Galactoarabinan (from Larch Tree), Aloe Barbadensis (Aloe Vera) Juice, Botanical Hyaluronic Acid, Tocopheryl Acetate (Vitamin E), Panthenol (Provitamin B5), Theobroma Cacao (Cocoa) Seed Extract, Benzyl Alcohol, Salicylic Acid, Carica Papaya (Papaya) Fruit Extract, Ginkgo Biloba Leaf Extract, Camellia Sinensis (Green Tea) Leaf Extract, Matricaria Recutita (Chamomile) Extract, Passiflora Edulis (Passion Fruit) Seed Oil, Polyacrylate Crosspolymer-6, Xanthan Gum, Hippophae Rhamnoides (Seabuckthorn) Fruit Oil, Corn-Derived Methyl Glucose Sesquistearate, Magnesium Ascorbyl Phosphate, Sorbic Acid, Lecithin, Polyhydroxystearic Acid, Isostearic Acid, Polyglyceryl-3 Polyricinoleate, Trisodium EDTA, Biocomplex2 (Euterpe Oleracea (Acai), Citrus Limon (Lemon), Malpighia Glabra (Barbados Cherry), Emblica Officinalis (Indian Gooseberry), Adansonia Digitata (Baobab), Myrciaria Dubia (Camu Camu), Daucus Carota Sativa (Carrot), Cocos Nucifera (Coconut), Water, Lycium Barbarum (Goji) Berry, Tapioca Starch From Cassava Root, Thioctic Acid (Alpha Lipoic Acid) and Ubiquinone (Coenzyme Q10)]. Store in controlled temperatures (4-20°C/39-68°F). Keep in a dark and dry place. Keep container closed.